On 19th September, a veterinary auditor from the Food Standards Agency (FSA), a field vet from the Animal and Plant Health Agency (APHA) and the FSA’s Director of Veterinary Services, jointly hosted a webinar on the topic of government veterinary careers. The aim of the webinar was to highlight the important work that government vets undertake and to provide a brief overview of the varied careers that are on offer. The seminar also highlighted to interested colleagues how to seek further information and advice from, and with, the support of the Government Veterinary Services (GVS) network. To signpost relevant training and other resources available to help develop veterinary careers. For those of you who don’t already know what a webinar is, it works exactly the same as someone delivering a presentation at a meeting - except that it is done over the internet, much like streaming a TV show. However, you can be anywhere in the world to watch and present at the same time. Someone in Aberdeen could therefore be watching the same live presentation at the same time as someone in Plymouth or outside the UK. Our webinar has already been watched by vets from Austria, China, Germany, Ireland, Portugal, Romania, South Africa, Spain, Trinidad and Tobago, UAE and the US. Why did GVS run a webinar? 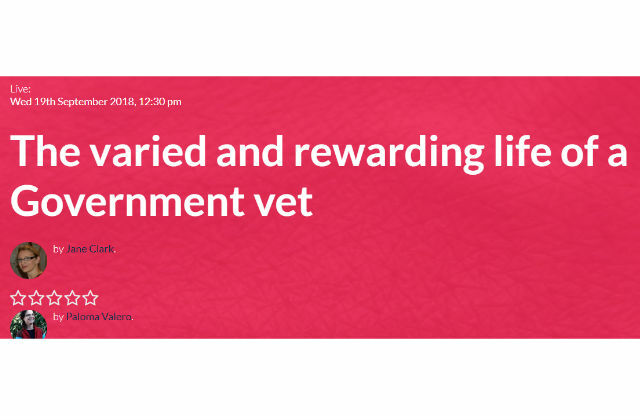 At GVS we wanted to reach out to our veterinary colleagues outside government to showcase and promote the important roles that government vets undertake. This includes highlighting the varied career opportunities available and encouraging more veterinary graduates and professionals to consider a varied and fulfilling career in Government service. All of our contributing vets have spent many years of their careers working for one of the many government organisations which employ vets, such as the FSA, APHA, the Home Office, the Veterinary Medicines Directorate and the Centre for Environment, Fisheries and Aquaculture Science, to name a few. Alongside this, the FSA is responsible for food safety and food hygiene across England, Wales and Northern Ireland. The FSA works with local authorities to enforce food safety regulations and its staff work in UK meat plants to check that standards are being met. In Scotland, all of this work is undertaken by Food Standards Scotland. The first presentation was covered by Raquel Cobos, Senior Veterinary Inspector, APHA Field Services (South West). Raquel presented examples from her work portfolio which also include animal welfare compliance and responding to notifiable disease investigations. The next presentation was given by Paloma Valero, who is currently a veterinary auditor for the FSA. As her role suggests, Paloma currently audits vets in abattoirs to ensure they are performing to the required standards and following correct procedures. The final presentation was given by Jane Clarke, Director of Veterinary Services at the FSA. Jane discussed the variety of roles that she has undertaken for both the FSA and APHA throughout her career, while highlighting her unexpected transition from private veterinary practice to a government career through her involvement in the Foot and Mouth Disease outbreak in 2001. We really hope that this has convinced you that the webinar is worth watching?! 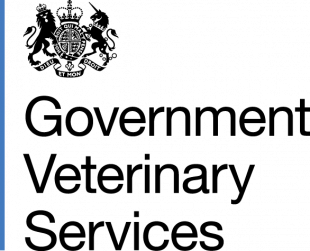 How can I watch the webinar? The entirety of the webinar is still available to watch and although questions can no longer be posted you can view all of the questions asked during the live event. The webinar itself lasts for 55 minutes and you have the flexibility to pause the webinar as it suits you. If you are interested in a career as a government vet or generally want to know what government vets do, please have a look as per the link below. The webinar is free to watch, all you need to do is to set up an account. So far our webinar has been watched and enjoyed both domestically and internationally, including vets from the US, South Africa and China. We would like to thank all of the vets out there who have shown an interest in our work and who have signalled their interest in joining our organisation. So all in all a very successful webinar and many thanks again to Paloma, Raquel and Jane. If, after reading this blog, you would also like some further information about career opportunities as a Government Vet, please contact us at gvs@defra.gov.uk. Alternatively, you can contact careers@apha.gov.uk and arrange to speak to a recent recruit who will tell you about the day-to-day job.